Our latest contest winner’s results revealed! Sue Tedrow has been teaching herself to smile again. It’s not that the 49-year-old elementary school aide and mother of two isn’t happy. It’s just that for her entire adult life, she never had teeth she wanted to show anyone; that is, not until she won Dear Doctor magazine’s Ultimate Smile Makeover contest. Sue no longer has to hide her teeth because she has a beautiful new smile, courtesy of her dental makeover team: Dr. Robin Vaughan and Dr. Shaun Williams of Glen Valley Dentistry in Caledonia, Michigan; and generous corporate sponsors, including Centric Laboratories of Grand Rapids, Michigan, Invisalign®, and Nimbus Dental. “It looks fabulous! 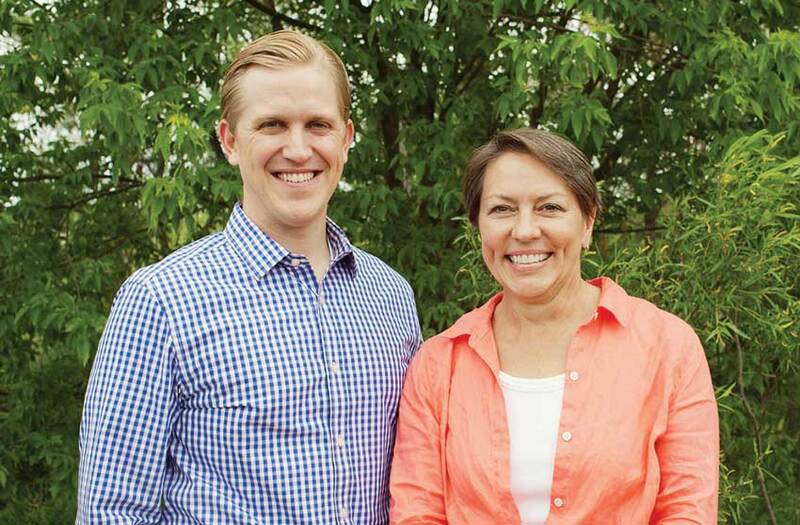 It’s a total transformation from before,” Sue remarked. “Before” meant a series of dental calamities that left Sue with a mouth full of decayed, discolored teeth — many of which needed root canal treatments and full-coverage dental crowns. Sue’s teeth had staining from the antibiotic tetracycline, which was given to her while her teeth were developing. It started when she was a child. Battling bronchitis, she was put on tetracycline — an antibiotic now known to cause discoloration of permanent teeth while they are forming. “My secondary teeth came in discolored from it,” Sue said. That was just the beginning. Later, when she was 8 years old, she suffered a bad fall from her horse. The trauma to Sue’s face was obvious: a broken nose and a gash in her forehead that required 18 stitches. What no one realized at the time was that her teeth also sustained damage. Sometimes when a tooth suffers a traumatic blow, the living tissue (including the nerves) within it dies. It can then become infected, requiring a root canal treatment to save the tooth. Sue has needed numerous root canal procedures throughout her life and she learned that her childhood accident was the likely culprit. Yet even that trauma was not the last of Sue’s dental woes. As a teen, she got braces to straighten her teeth; but while undergoing orthodontics, her tooth enamel started breaking down. “When the brackets came off my teeth, there were white spots,” she said, adding that her orthodontist then tried to polish the spots off without success. Those white spots represented the start of tooth decay from loss of minerals from the enamel surface. Sue and her family decided to stop orthodontic treatment and never completed the crucial retention step of wearing a retainer to maintain position of the newly straightened teeth. Sue’s teeth eventually drifted back out of alignment. Meanwhile, she had her six front teeth capped in high school to improve their appearance. But that didn’t help much, she said, because “the crowns were put on to match the bottom teeth, but the discoloration [from the antibiotics] was still there.” So Sue became practiced at hiding her teeth when she smiled. Fast forward 30 years. Sue was sitting in the office of her family dentist, Dr. Robin Vaughan, whose skilled, compassionate care helped to erase Sue’s former fears of dentistry — but not her long-standing susceptibility to dental problems. Sue was dumbfounded months later when Dear Doctor’s publisher, Dr. Mario Vilardi, called to tell her she had won the contest. 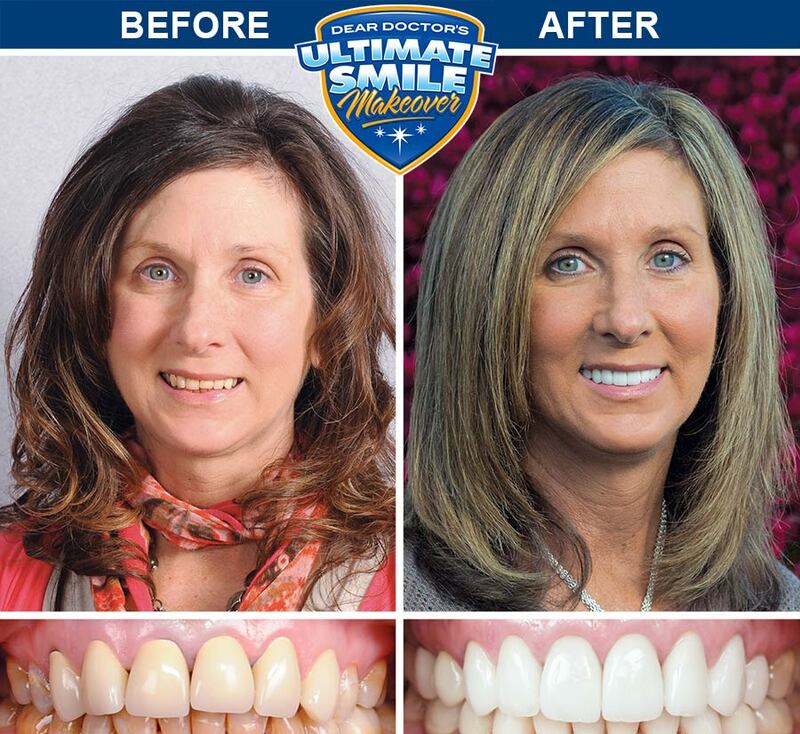 Winning the makeover meant Sue could have all the cosmetic dental work she needed to have the smile of her dreams — completely free of charge. Best of all, the makeover would be completed by her own dentists, Dr. Robin Vaughan and Dr. Shaun Williams. The first step in the makeover process was a complete set of dental x-ray pictures, which revealed the need for more root canal procedures in two of the top teeth that had been capped back when she was a teenager. Sue was already familiar with root canal treatment and understood that this routine dental procedure wouldn’t cause her discomfort. It involves removing any diseased tissue from within the narrow chambers deep within the tooth roots known as “root canals,” and disinfecting, filling and then sealing them to prevent further infection. Sue’s lower front teeth were crowded and misaligned before orthodontic treatment. Invisalign clear aligners created a much more attractive tooth alignment that will be easier for Sue to keep clean with regular brushing and flossing. Sue was also retreated orthodontically. But this time, instead of traditional metal braces, she received a type of orthodontic appliance that didn’t exist when she was a teen: Invisalign® clear aligners. With this system, clear removable computer-generated “trays” are worn to move teeth gradually into correct alignment. The trays, which are custom-designed for each patient, are changed every two weeks to accomplish the next stage of movement. “I really was impressed with the Invisalign,” Sue said. “You could watch the teeth and see how they were lining up on a gradual basis.” The total treatment time for the alignment process was 11 months. Sue is now wearing her retainers conscientiously to maintain the results. Invisalign works the same way traditional braces do: by applying carefully controlled forces to teeth to move them into a better position. But there are no metal brackets or wires; instead, Invisalign clear orthodontic aligners are made of nearly invisible polyurethane plastic. Also, the aligners are changed frequently throughout the treatment. Here’s why: Specialized computer software is used to design a plan for moving the teeth from their current positions into the best possible alignment. This movement is broken down into perhaps several dozen stages. 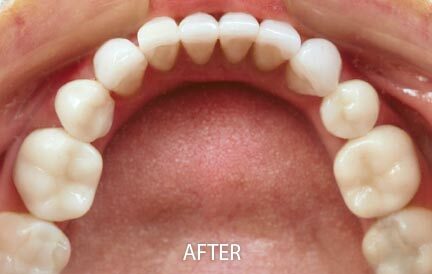 For each stage of movement, two plastic mouth “trays” or “aligners” are made (or one tray if just the top or bottom teeth are being straightened). Sue wore that first set of trays for two weeks, for a minimum of 20 hours per day. She then moved on to the next set of aligners in her series to accomplish the next stage of gradual movement. She kept doing this until her teeth were correctly aligned. Once Sue’s teeth were free of infection following root canal treatment and properly aligned, it was time to address her old, failing crowns and her discolored bottom teeth. Dr. Williams planned to create new custom porcelain crowns for Sue, but first he needed to whiten her bottom teeth so that, this time, the new crowns could be fabricated in a more attractive matching shade. An in-office whitening treatment was tried first, because that was the most conservative route to whiter teeth. 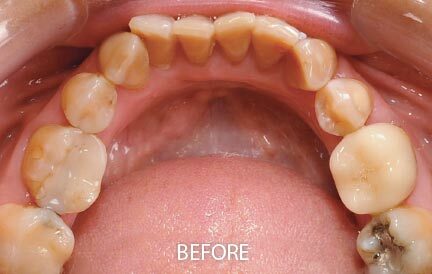 But as is often the case with tetracycline staining, the stain was too deeply ingrained for this treatment to improve the appearance of the teeth as much as was hoped for, so Dr. Williams came up with a new plan. At the outset of the makeover process, Sue had been shown computer simulations of what her smile could look like. But it was now time for Sue to preview the results with an actual physical model of her teeth; that way, she could give her final OK to the plan before it became a permanent part of her mouth. Sue’s makeover team worked with Centric Laboratories to create a wax model of Sue’s teeth as they would look with new crowns on top teeth and veneers on the bottom. When Sue gave the thumbs up, Dr. Williams began shaping her teeth to receive her new crowns and veneers. This step required temporary crowns and veneers to be placed first, which allowed Sue to visualize the improvement in her smile right away. Sue said she was very grateful for the care she received from her makeover team and the office staff. Sue has been getting a lot of compliments on her smile these days — even from people who don’t know she’s had cosmetic dental work done. Dr. Robin Vaughan and Dr. Shaun Williams practice family and cosmetic dentistry at Glen Valley Dentistry in Caledonia, Michigan. They are trained and certified in some of the most advanced dental treatments available today, including dental implants, Invisalign clear aligners, and CEREC dental restorations made in-office with the aid of specialized computer-aided design and milling equipment. They consider all of their patients part of Glen Valley Dentistry’s “extended family” and go out of their way to make sure every single one of them has a relaxed and comfortable experience when visiting the dental office. Some of the techniques they use to put visitors at ease include: complimentary nitrous oxide on request, warm blankets and personalized music selection. “We have tried to create a friendly, non-threatening environment for your entire family, so that you can all enjoy better dental health,” said Dr. Vaughan, who earned her dental degree from the University of Southern California in 1986. She supervised Sue’s Invisalign treatment. Dr. Williams, who graduated from dental school at University of Detroit Mercy in 2007, completed Sue’s restorative work. Sue was absolutely thrilled with the results, saying the crowns and veneers Dr. Williams installed had a “sparkle” that brightened her smile in a delightfully natural-looking way. “My favorite part about working with the Glen Valley team is when we come together to meet and exceed our patients’ expectations,” said Dr. Williams.